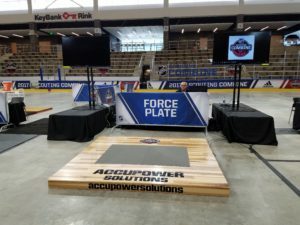 AccuPower Solutions was the official provider of force plate measurement technology for the 2017 NHL Draft Combine, held May 28-June 3rd in Buffalo, NY. AccuPower Solutions administered vertical jump testing to the 100+ invited draft prospects and provided all teams with a full video analysis and detailed reports immediately following the event. The event allowed for the unveiling of AccuPower 3.0, the 5th generation of AccuPower Software. AccuPower 3.0 is arguably our biggest software development effort and includes many exciting new features, including some designed specifically for NHL Combine. As was the case with AccuPower 2.0, the new software release is designed to accommodate large-scale athlete testing and certainly did not disappoint at the Combine. AccuPower Solutions introduced a dual-platform AccuPower (AMTI, Waterford, MA) configuration for use at the Combine. 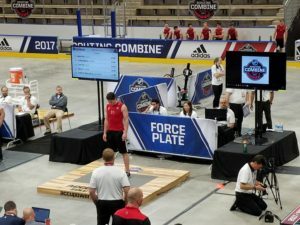 This event marked the first time that a dual force plate system has been used at the combine. A dual plate analysis allows for a robust analysis of the athlete’s ability to generate force and power, and more specifically Right/Left Leg Symmetry in force and power output. AccuPower 3.0 introduced real-time high-speed video and force display during the Combine. The on board video system in AccuPower 3.0 displays forces and a force vector overlay in real time during data collection. Immediately following data collection, instant replay allowed the attendees to immediately review key data points within a full HD video at 120 frames per second. Two cameras were used at the combine, providing a front and profile view of each athletes testing. Along with the normal vertical jump analysis, AccuPower 3.0 provided several “NHL combine specific” measures. AccuPower Solutions worked with NHL Strength Coaches to refine and validate these combine specific measures, and in the process enhanced the reliability of those measures. AccuPower 3.0 was used to rerun force plate data from previous years and incorporated the historical data into percentile rank calculations for this year’s data. A full release of AccuPower 3.0 is planned for later this summer. Contact AccuPower Solutions for more information.